Garden Party Champagne IPA is a collision of two worlds: the dry effervescence of your favorite bubbly, and the juicy, fruity intensity of your favorite IPA. Garden Party IPA features bold aroma hop additions of Chinook and Mosaic, torrified red wheat to impart notes of stone fruit and heather tips, and an extremely dry finish that will have you reaching for another. So throw on your best duds and toast those close to you, because there is no party like a Garden Party. 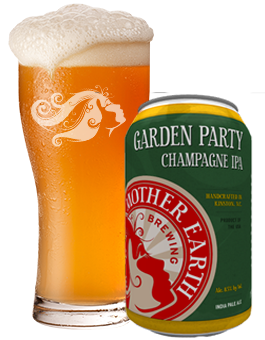 "Garden Party Champange IPA is our take on the latest innovation within the IPA category. This unique marriage of Chinook hops and micronized wheat present aromatics of citrus and pine accompanied by peach and stone-fruit flavors on the pallet with a dry finish."